You know how you have to exercise but as January moves on you can’t quite force yourself into lycra? 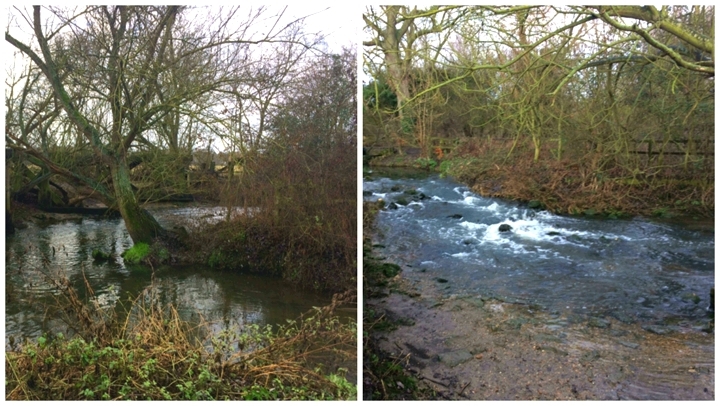 A brisk walk along the banks of the Great River Ouse at Houghton Meadows could be exactly what you and yours need to blow away the cobwebs without having to put on your sweat bands. It’s an easy flat circular route and although much is over grass if you’ve got an off-roader buggy it will handle the ground easily. Dangle the carrot of a brownie and hot chocolate if they can get to the half way point without whinging. 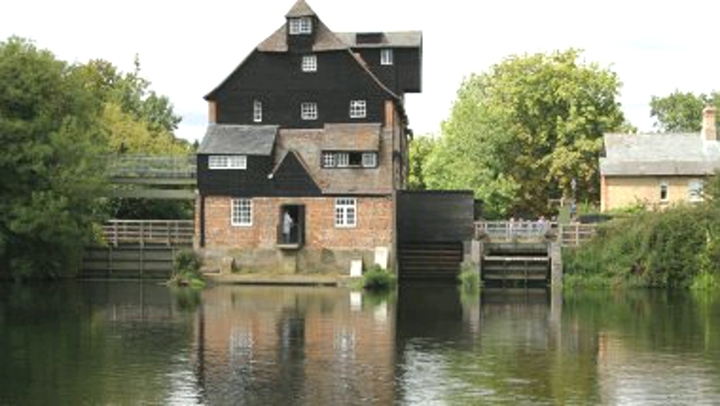 The walk starts at Houghton Mill, the oldest working mill on the Great River Ouse whose origins date back to 974 when it was linked with the Benedictine Abbey at Ramsey. The current building dates from the 17th century. 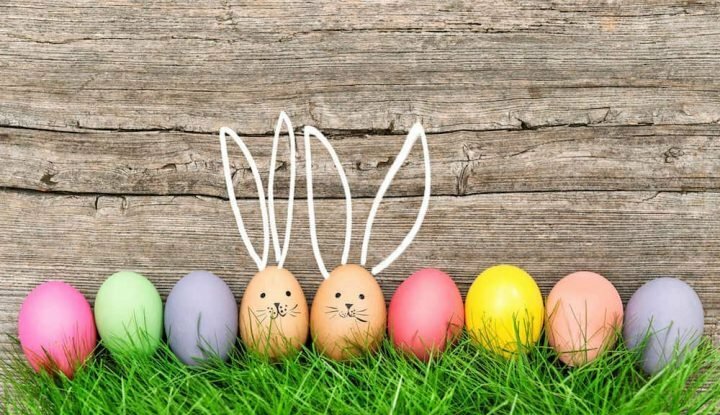 The mill creaks into action each Sunday and bank holidays between March and Oct and is totally worth the visit – we always come here in the summer for a picnic – so pop it in the diary for springtime or frankly don’t worry about it, it’s my job to remind you! It’s part of the National Trust so don’t forget your membership card if you have one for free parking, otherwise you’ll need £2.50 in change. 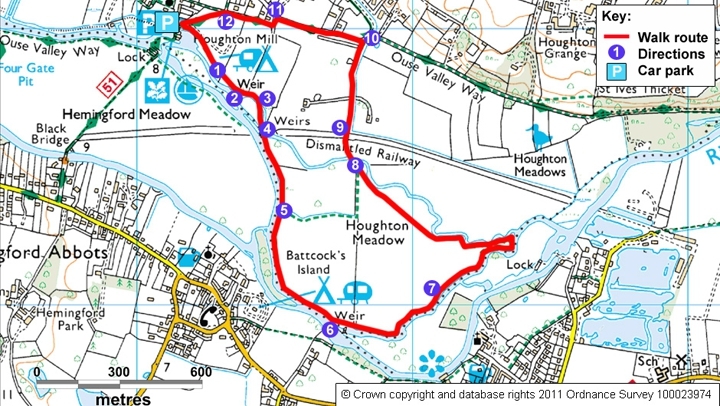 There are various routes available, from a couple of miles wander to an eight mile stride and they’re all dog friendly. With little legs in tow I wasn’t going to push my luck, and plumped for the shorter one. The map below details the walk and it’s generally well marked. 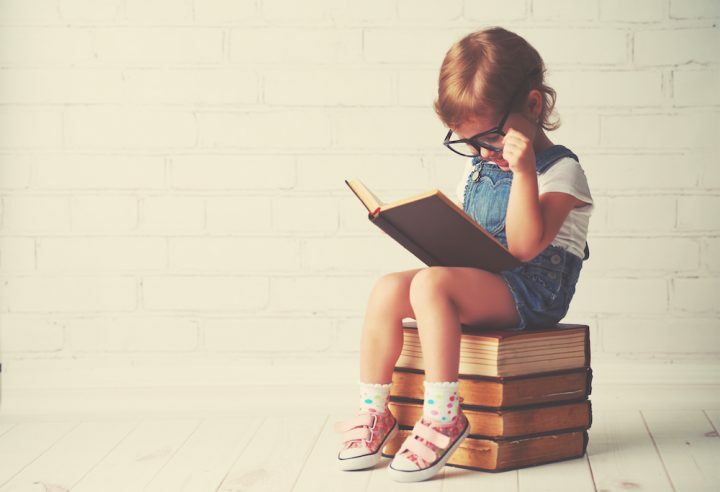 I’ll own it – we did go wrong once and had to retrace our footsteps but there’s no need for a degree in navigation. Head through the car park and caravan site and over the first of many little bridges that crisscross over the river, one of which goes over the back stream weir from the Ouse. 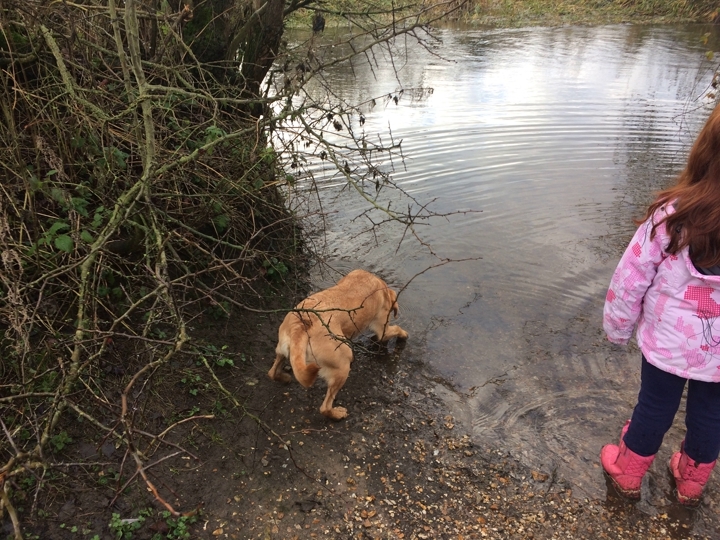 The Muddys loved the various opportunities to test how waterproof their wellies were – waders might have been better. Follow the route through two fields and yet another bridge. If things are going Pete Tong at this stage bail out and shorten the walk by turning left after crossing this bridge and take the green route to point 8 on the map at the Trout Stream Bridge. Otherwise trot on across Houghton Meadow, keeping the river to your right and over another large weir. 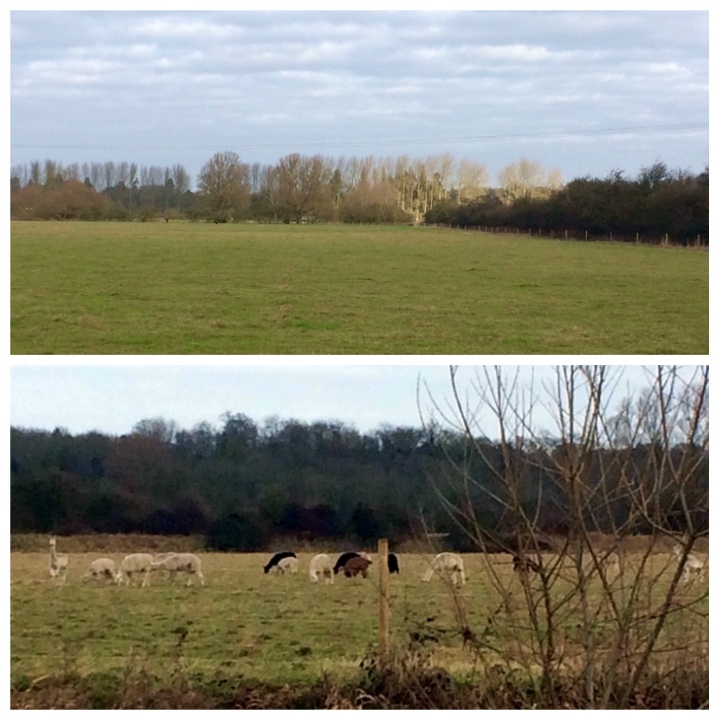 I’m no threat to Bill Oddie but there was plenty of bird and animal life to distract – alpacas, cows, Canada geese, swans with their cygnets (all very hissy) and don’t quote me but I think we saw a sparrowhawk. At the Trout Stream take a left, still following the meadow with the steam on your right and when you reach a bridge and gate continue through on the old railway embankment. Turn left down Thicket Road and at The Elms, with the very large gates; turn left again which will take you along a narrow footpath enclosed on eitherside. Go through the gate on your left and immediately bear right to bring you back to Houghton Mill – bravo, you’ve made it! After such punishing power walking – not sure I even broke into a sweat – I could have sold my body for a coffee and a dollop of chocolate cake (though seriously what can 17p buy these days?). There’s a café at Houghton Mill but out of season it’s not always open mid week. 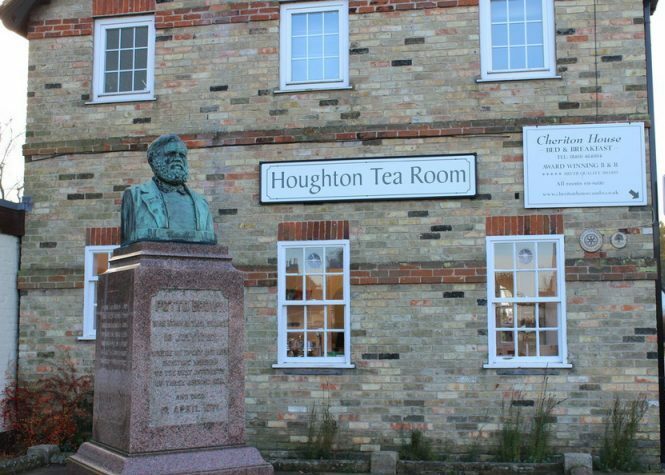 However, all is not lost – I stumbled across the Houghton Tea Rooms by chance as we turned out of the car park and headed up to the village square. What a super little find, a teeny tiny cute-to-the-max brew house that’s worth a visit, if only to watch your children dribbling at the cake counter – all home made by owner Linda Prentice who clearly knows a thing or two about making a sponge rise. There’s also a small gallery attached if you still have any energy left to mooch. 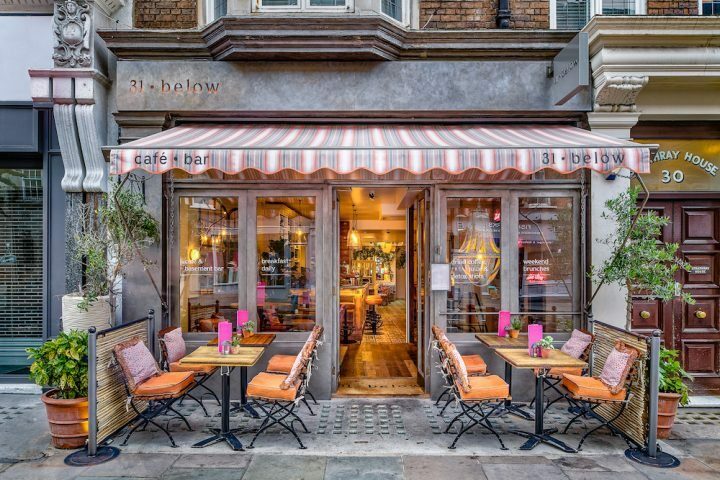 The menu is definitely café style – sandwiches/baguettes start around £3, quiches and jackets will set you back £3.50 and you can snaffle a cake for a very reasonable £1.85. Nothing that is going to distress the culinary greats but it’s all homemade wholesome food. If you’re pressed for time they also offer take away food and drink. 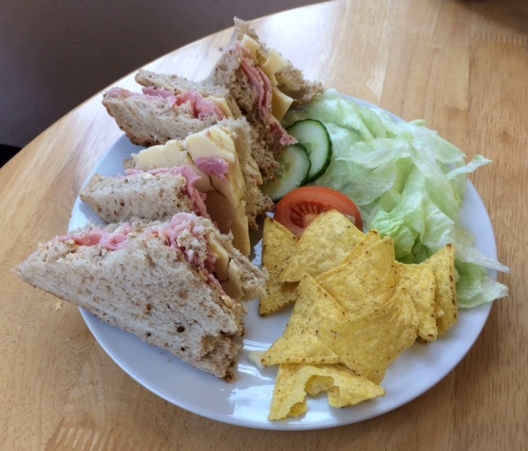 As we arrived close to midday I ditched the Annabelle Karmel meal I had premade (*cough*) and ordered two plates of sandwiches – kids lunch done. I had toasted fruit bread and the essential coffee but I couldn’t walk out without trying a cake so I bought my son and daughter one between them (great excuse) and polished it off! 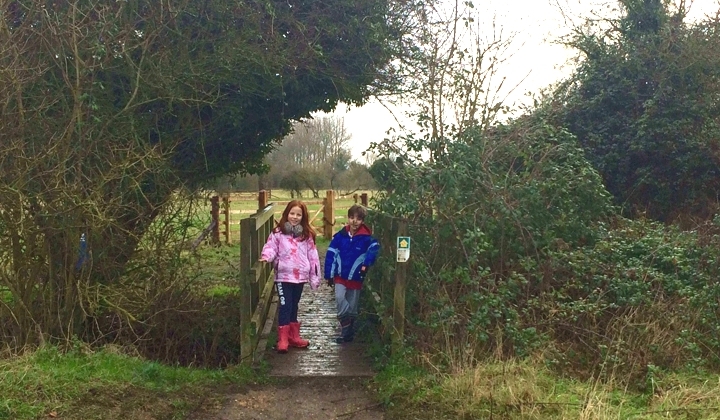 The walk was definitely muddier than we’d expected which did kind of increase the enjoyment levels – slip sliding across the bridges and the mini Muddys were quite literally immersed in mud at one stage but they loved it. Taking into account the various stops – we had to attempt tree climbing and such frolics – the walk took just over an hour and a half which was pretty much perfect with not a whinge to be heard. I would plan a visit after dry or frosty weather, because when the inevitable rain comes the meadows will be even squelchier. 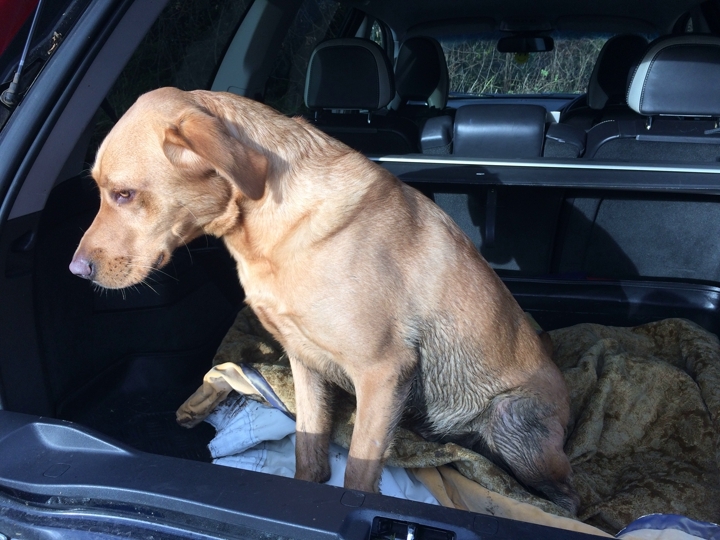 Just look at the state of the muddy dog – yeah, go on, hang your head in shame! ‪Houghton Tea Rooms, Mill Street, Houghton, Huntingdon PE29 2AZ, stneotscakes.co.uk. 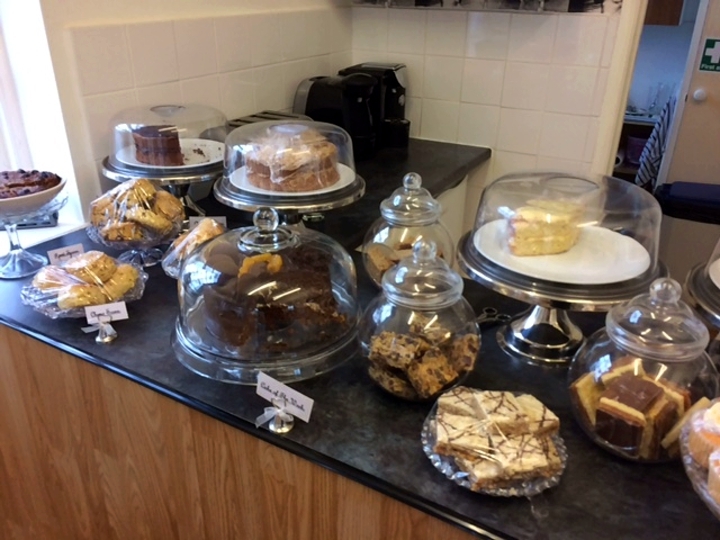 The teashop is open Wed-Fri 11- 4pm and Sat & Sun 10- 4pm.